Artist Jun Kaneko used his struggle to design sets and costumes for an opera to illustrate the need for perseverance in creating art. If art is finding beauty in the unexpected, then the International Cultural Summit was a runaway success. A panel discussion about preserving the host culture might have revolved around bitter feelings about why hula -- the most prevalent art form in the state, used to promote Hawaii worldwide -- receives the least financial support. An audience member stood up and asked kumu hula Pualani Kanakaole Kanahele to lead a pule, or prayer, for another Hawaiian leader who was ill. Kanahele joined hands with her fellow panelists: Robin Danner of the Council for Native Hawaiian Advancement, singer Noland Conjugacion, kumu hula Vicky Holt-Takamine and Neil Hannahs of Kamehameha Schools. The audience followed their example. Soon, strangers formed a circle and broke into chant -- a chicken- skin moment that left tears in the eyes of most participants. The Hawaiian cultural leaders then touched foreheads in the traditional Polynesian greeting. Words about respect, diversity, collaboration and heritage weren't just heard. They were felt. Indeed, diversity didn't need to be discussed at the inaugural summit, which an drew an estimated 200 people from varied backgrounds to sessions "navigating global cultural issues" at the Hawai'i Convention Center last week. Instead, diversity was on full display at an event that Mona Abadir, chairwoman of the Hawaii State Foundation of Culture and the Arts, hoped would spark an explosion of creativity and action in the community. Culture is the center of everything we do, she said, like the cog of a wheel. "Everything else is just spokes." People typically experience the most freedom in childhood and advanced age, she said. Containment and control prevail in midlife, when convention restricts viewpoints. Art is one avenue to reclaiming that elusive freedom. And when you do, said Abadir, "you can lead a much happier, more productive life," which, in turn, alters the fabric of society. Keynote speaker Claudine Brown of Brooklyn, N.Y., talked about the essential role that artists play in forming communities. "When we visit a city, it remains with us because of the people in it," she said. New Orleans is an example. People struggling to rebuild it say, "We want our artists back," she said, especially the jazz musicians that gave the city so much character and identity. Artist Jun Kaneko, who periodically rents a studio on Kauai, encouraged experimentation and perseverance, something he needed a lot of when designing the set and costumes for Opera Omaha's "Madama Butterfly." 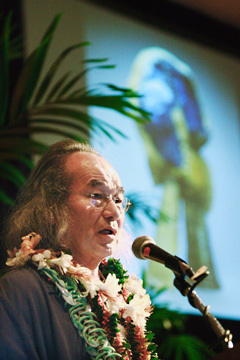 In an entertaining presentation, Kaneko described the arduous process of creating the pieces, which will be used in Hawaii Opera Theatre's 2007 production. Kaneko, who also sculpted the art in front of the Honolulu Academy of Arts and the Waikiki Aquarium, complained that "everything is moving and it drives me nuts!" He prefers sculpture, he said, because they "don't move every minute." Wade Davis, an explorer-in-residence at the National Geographic Society, author, and prize-winning documentary television producer, dazzled the audience with his intellect and perspective on "changing the way the world views and values culture." He sailed aboard the Hokule'a last year for a National Geographic show that will air later this year or in early 2007. "Culture is not decorative," he said after he managed to break away from small crowds of admirers. "It's not trivial. It's the (foundation) of moral and ethical values. "I think the interesting thing about Hawaii is that ... it has had a turbulent history." Though people in Hawaiian history have been "marginalized," Davis said, "the point of redemption is that we're talking about culture. The Hokule'a is the essence of Hawaii. It's a living monument. The rhythm of ancient Polynesian life can still be found in the Hawaiian Islands, and that's what makes this place resonate with meaning." And that's something everyone who heard Kanahele's chant understood.